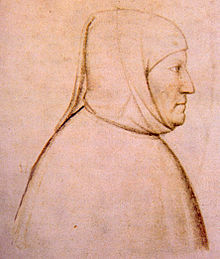 Francesco Petrarca (or Petrarch) (July 20, 1304 – July 19, 1374) was an Italian scholar, poet, and early humanist. Petrarch and Dante are considered the fathers of the Renaissance. To-day I made the ascent of the highest mountain in this region, which is not improperly called Ventosum. My only motive was the wish to see what so great an elevation had to offer. Continued work and application form my soul's nourishment. So soon as I commenced to rest and relax I should cease to live. "This age of ours consequently has let fall, bit by bit, some of the richest and sweetest fruits that the tree of knowledge has yielded; has thrown away the results of the vigils and labours of the most illustrious men of genius, things of more value, I am almost tempted to say, than anything else in the whole world." To-day I made the ascent of the highest mountain in this region, which is not improperly called Ventosum. My only motive was the wish to see what so great an elevation had to offer. I have had the expedition in mind for many years; for, as you know, I have lived in this region from infancy, having been cast here by that fate which determines the affairs of men. Consequently the mountain, which is visible from a great distance, was ever before my eyes, and I conceived the plan of some time doing what I have at last accomplished to-day. Letter to Dionigi di Borgo San Sepolcro (26 April 1336), "The Ascent of Mount Ventoux" in Familiar Letters as translated by James Harvey Robinson (1898); the name Mount Ventosum relates to it being a windy mountain. I rejoiced in my progress, mourned my weaknesses, and commiserated the universal instability of human conduct. I had well-nigh forgotten where I was and our object in coming; but at last I dismissed my anxieties, which were better suited to other surroundings, and resolved to look about me and see what we had come to see. The sinking sun and the lengthening shadows of the mountain were already warning us that the time was near at hand when we must go. As if suddenly wakened from sleep, I turned about and gazed toward the west. I was unable to discern the summits of the Pyrenees, which form the barrier between France and Spain; not because of any intervening obstacle that I know of but owing simply to the insufficiency of our mortal vision. My brother, waiting to hear something of St. Augustine's from my lips, stood attentively by. I call him, and God too, to witness that where I first fixed my eyes it was written: "And men go about to wonder at the heights of the mountains, and the mighty waves of the sea, and the wide sweep of rivers, and the circuit of the ocean, and the revolution of the stars, but themselves they consider not." I was abashed, and, asking my brother (who was anxious to hear more), not to annoy me, I closed the book, angry with myself that I should still be admiring earthly things who might long ago have learned from even the pagan philosophers that nothing is wonderful but the soul, which, when great itself, finds nothing great outside itself. Then, in truth, I was satisfied that I had seen enough of the mountain; I turned my inward eye upon myself, and from that time not a syllable fell from my lips until we reached the bottom again. Those words had given me occupation enough, for I could not believe that it was by a mere accident that I happened upon them. What I had there read I believed to be addressed to me and to no other, remembering that St. Augustine had once suspected the same thing in his own case, when, on opening the book of the Apostle, as he himself tells us, the first words that he saw there were, "Not in rioting and drunkenness, not in chambering and wantonness, not in strife and envying. But put ye on the Lord Jesus Christ, and make not provision for the flesh, to fulfil the lusts thereof." And more than mortal seems thy countenance. I certainly will not reject the praise you bestow upon me for having stimulated in many instances, not only in Italy but perhaps beyond its confines also, the pursuit of studies such as ours, which have suffered neglect for so many centuries; I am, indeed, almost the oldest of those among us who are engaged in the cultivation of these subjects. But I cannot accept the conclusion you draw from this, namely, that I should give place to younger minds, and, interrupting the plan of work on which I am engaged, give others an opportunity to write something, if they will, and not seem longer to desire to reserve everything for my own pen. How radically do our opinions differ, although, at bottom, our object is the same! I seem to you to have written everything, or at least a great deal, while to myself I appear to have produced almost nothing. You, my friend, by a strange confusion of arguments, try to dissuade me from continuing my chosen work by urging, on the one hand, the hopelessness of bringing my task to completion, and by dwelling, on the other, upon the glory which I have already acquired. Then, after asserting that I have filled the world with my writings, you ask me if I expect to equal the number of volumes written by Origen or Augustine. No one, it seems to me, can hope to equal Augustine. Who, nowadays, could hope to equal one who, in my judgment, was the greatest in an age fertile in great minds? As for Origen, you know that I am wont to value quality rather than quantity, and I should prefer to have produced a very few irreproachable works rather than numberless volumes such as those of Origen, which are filled with grave and intolerable errors. Continued work and application form my soul's nourishment. So soon as I commenced to rest and relax I should cease to live. I know my own powers. I am not fitted for other kinds of work, but my reading and writing, which you would have me discontinue, are easy tasks, nay, they are a delightful rest, and relieve the burden of heavier anxieties. There is no lighter burden, nor more agreeable, than a pen. Other pleasures fail us or wound us while they charm, but the pen we take up rejoicing and lay down with satisfaction, for it has the power to advantage not only its lord and master, but many others as well, even though they be far away — sometimes, indeed, though they be not born for thousands of years to come. I believe I speak but the strict truth when I claim that as there is none among earthly delights more noble than literature, so there is none so lasting, none gentler, or more faithful; there is none which accompanies its possessor through the vicissitudes of life at so small a cost of effort or anxiety. Full text in Italian. English translations are taken from Petrarch's Lyric Poems: The Rime Sparse and Other Lyrics (1976) ed. and trans. by ‎Robert M. Durling ISBN 0674663489, unless otherwise stated. You who hear in scattered rhymes the sound of those sighs with which I nourished my heart during my first youthful error, when I was in part another man from what I am now. Whatever pleases in the world is a brief dream. Your lovely eyes, Lady, bound me. Understand me who can, for I understand myself. If it is not love, what then is it that I feel? But if it is love, before God, what kind of thing is it? If it is good, whence comes this bitter mortal effect? If it is evil, why is each torment so sweet? Peace I do not find, and I have no wish to make war; and I fear and hope, and burn and am of ice. quand'era in parte altr'uom da quel ch'i' sono. And of my raving, shame is the fruit, and repentance, and the clear knowledge that whatever pleases in the world is a brief dream. For your lovely eyes, Lady, bound me. Tempo da travagliare è quanto è 'l giorno. The time to labor is while it is day. But still I cannot seek paths so harsh or so savage that Love does not always come along discoursing with me and I with him. Ah new people, haughty beyond measure, irreverent to so great a mother! One falls in love through fame. Before the day of his last departure no man is to be called happy. Da'duo begli occhi che legato m'ànno. [From] two lovely eyes that have bound me. né di lui né di lei molto mi fido. Because life is short and my wit is afraid of the high undertaking, in neither do I have much confidence. è per lassar piú l'animo invescato. This mortal life is like a meadow where the serpent lies among the flowers and grass, and if anything we see there pleases our eyes, the result is to enlime our souls more deeply. You, therefore, if you seek ever to have quiet minds before the last day, follow the few and not the crowd. ben la vittoriosa sua ventura. Hannibal was victorious, but he did not know later how to make good use of his victorious fortune. dche fa per fama gli uomini immortali. My Pandolfo, those works are frail in the long run, but our study is the one that makes men immortal through fame. Love governs his empire without a sword. Intendami chi pò, ch'i' m'intend'io. Proverbio "ama chi t'ama" è fatto antico. The proverb "Love him who loves you" is an ancient fact. Per bene star si scende molte miglia. One goes many miles to be at ease. A thing seems a great marvel but then is despised. Né del vulgo mi cal, né di Fortuna. Nor do I care about the mob or about Fortune. True is the proverb, one's hair will change before one's habits. Le bionde treccie sopra il collo sciolte. The blond tresses loosened on her neck. non per odio d'altrui, né per disprezzo. I am speaking to tell the truth, not from hatred or scorn of anyone. Ma s'egli è amor, perdio, che cosa et quale? e temo, et spero; et ardo, et son un ghiaccio. For he makes a good end who dies loving well. Sarò qual fui, vivrò com'io son visso. I shall be what I have been, shall live as I have lived. Sol se stessa, et nulla altra, simiglia. Resembles herself and no other. Full of a yearning thought that makes me stray away from all others. solco onde, e 'n rena fondo, et scrivo in vento. Blessed in sleep and satisfied to languish, to embrace shadows, and to pursue the summer breeze, I swim through a sea that has no floor or shore, I plow the waves and found my house on sand and write on the wind. a quel dolce penser che 'n vita il tene. Sleep is truly, as they say, akin to death, and relieves the heart of the sweet care that keeps it in life. Le città son nemiche, amici i boschi. Cities are hateful to me, friendly the woods. Nulla al mondo è che non possano i versi. There is nothing in the world that cannot be done by verses. di castità par ch'ella adorni et fregi. Your high beauty, which has no equal in the world, is painful to you except insofar as it seems to adorn and set off your lovely treasure of chastity. With Death at my side I seek new counsel for my life, and I see the better but I lay hold on the worse. né sí freddo voler, che non si scalde. There is no heart so hard that by weeping, praying, loving, it may not at some time be moved, nor will so cold that it cannot be warmed. Ché 'ncontra 'l ciel non val difesa humana. For no human defense avails against Heaven. La vita fugge, et non s'arresta una hora. Life flees and does not stop an hour. veramente fallace è la speranza. Truly, we are dust and shadow; truly, desire is blind and greedy; truly, hope deceives. tutti inseme pregando ch'i' sempre ami. preghi ch'i' sprezzi 'l mondo e i suoi dolci hami. The waters speak of love and the breeze and the branches and the little birds and the fish and the flowers and the grass, all together begging me always to love. But you, born in a happy hour, who call me from Heaven: by the memory of your untimely death you beg me to scorn the world and its sweet hooks. I am she who gave you so much war and completed my day before evening. our destiny is with us from our birth. O che lieve è inganar chi s'assecura! Oh how easy it is to deceive one who is confident! et chi ben pò morir, non cerchi indugio. ché legno vecchio mai non róse tarlo. He knows that I am speaking the truth, for no worm ever gnawed old wood. Obedir a Natura in tutto è il meglio. To obey Nature in all is best. Petrarch was the final blossom and perfection of the Troubadours. And faithful Petrarch gloriously crowned. 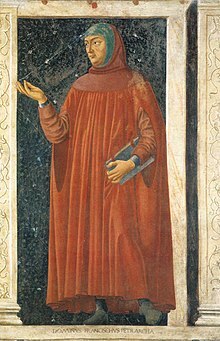 Francesco Petrarca, the mirror of our century, after completing a vast array of volumes, on reaching his seventy-first year, closed his last day in his library. He was found leaning over a book as if sleeping, so that his death was not at first suspected by his household. The reason for this contrast between the French and the Italian mediaeval literature is not far to seek. 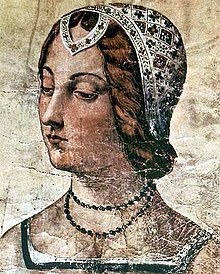 Allegory is a characteristically mediaeval form; and in Italy the Middle Ages began so late and the Renaissance came so early that that country never had the opportunity to fall completely under the spell that held France from the time of the Roman de la Rose till the end of the fifteenth century. Thus Petrarch, in spite of the fact that he wrote perhaps more pure allegory than any other Italian, was at the same time an enthusiast for the New Learning. Petrarch, a character on whom I never think but with love, formed his mind entirely in Solitude, and there rendered himself capable of transacting the most important political affairs. Petrarch was, doubtless, sometimes what persons frequently become in Solitude, satirical, peevish and choleric. 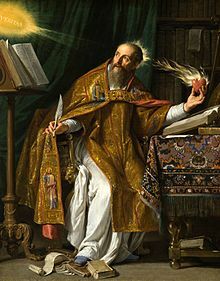 He has, in particular, been reproached with great severities, on account of his lively pictures of the manners of his age, and especially his description of the infamous vices practised at Avignon, during the pontificate of the sixth Clement. But Petrarch possessed a profound knowledge of the human heart, and extraordinary address in working upon the passions and directing them as he pleased. The Abbé de Sade, the best historian of his life, says, that he is scarcely known, but as the tender and elegant poet, who loved with ardor and sung in the most impassioned strains the charms of his mistress; and that nothing more is known of his character. Even authors are ignorant of the obligations which literature owes him; that he rescued it from the barbarism beneath which it had so long been buried; that he saved the best works of the ancient writers from dust and destruction, and that all these treasures would have been lost to us, if he had not sought and procured correct copies of them. It is not perhaps, generally known, that he first revived the study of the Belles Lettres in Europe; that he purified the taste of the age; that he himself thought and wrote like a citizen of ancient and independent Rome; that he extirpated numerous prejudices, and paved the way to further improvements, in the circle of human knowledge; that to the hour of his death, he continued to exercise his distinguished talents, and in each successive work always surpassed the preceding. Still less is it known, that Petrarch was an able statesman; that the greatest sovereigns of his age confided to him the most difficult negotiations, and consulted him on their most important concerns; that in the fourteenth century, he possessed a higher reputation, credit and influence, than any man of learning of the present day; that three popes, an emperor, a king of France, a sovereign of Naples, a crowd of cardinals, the greatest princes, and most illustrious lords of Italy, courted his friendship, and desired his company; that, as a statesman, an ambassador and minister they employed him in the most intricate affairs of those times; that, in return, he was not backward in telling them the most unpleasant truths; that Solitude alone supplied him with all this power; that none was better acquainted with its advantages, Cherished them with such fondness, or extolled them with such energy, and at length, preferred leisure and liberty to every other consideration. He appeared, a long time, enervated by love, to which he had devoted the prime of his life, but he suddenly abandoned the soft and effeminate tone, in which he sighed at the feet of his Laura. He then addressed himself, with manly boldness, to kings, emperors, and popes, and always with that confidence which splendid talents and high reputation inspire. This page was last edited on 16 March 2019, at 12:56.